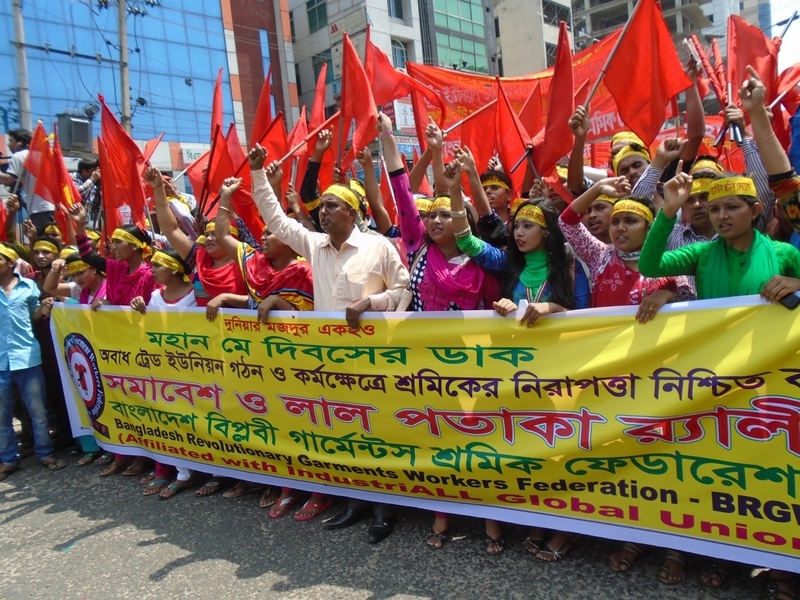 UNISON has teamed up with Labour Behind the Label to launch a new solidarity fund to provide financial support to the Bangladesh Revolutionary Garment Workers Federation (BRGWF) to organise garment factory workers unions in Gazipur, an industrial hub just outside of Dhaka. The collapse of the Rana Plaza building in April 2013 brought the world’s spotlight on to the Bangladesh garment industry and the terrible conditions that its mainly women workers are forced to endure while making clothes for our high street. A vital part of ensuring we never see another Rana Plaza is for workers themselves to organise and demand change. Workers are fighting back – but they do so at great risk. In the last year attacks on trade union organisers have started to increase, including workplace harassment, sackings, violent attacks and arrest. These workers are among the lowest paid in the industry; in Bangladesh the minimum wage is estimated to be just a fifth of a living wage and this represents another barrier to organising, with workers unable to financially support their own unions through dues or donations. The best way we can support Bangladesh’s garment workers to demand their rights is through solidarity. Since June 2014 UNISON International Development Fund has been working with UK campaigners Labour Behind the Label to do just this. With UNISON’s support BRGWF have been able to significantly increase their organising efforts by setting up a small office and establishing an organising team in one of the fasted growing industry hubs in the country. Donating to the solidarity fund can provide long term, secure funding to enable BRGWF to continue its work to challenge the terrible working conditions Bangladesh workers endure while making clothes for the UK high street. Can your branch donate to the new Bangladesh Solidarity Fund? Many UNISON branches are keen to establish closer links with sister unions, yet setting up formal twinning programmes can be difficult, particularly for smaller branches. Participation in the Bangladesh Solidarity Fund enables branches of any size to be part of an ongoing UNISON supported solidarity programme and provides an opportunity to build closer links with the Bangladeshi trade union movement. Want to help spread the word within your UNISON branch? Download this leaflet and let us know you are supporting the fund. £4000 will pay for the cost of running the office including rent, internet and mobile phones for staff. £6000 will pay salaries for three organisers to work full time and provide travel expenses for them to get to more remote workplaces. A further £2000 will pay for an organising coordinator, responsible for developing the organising strategy and developing training programmes. You can do this by bank transfer or by sending a cheque in the post. To donate by cheque, please make it payable to Labour Behind the Label, with ‘Solidarity Fund’ written on the reverse and send it to Labour Behind the Label, Easton Business Centre, Bristol BS5 0HE. Account number: 65229826 (a unique account for the solidarity fund).